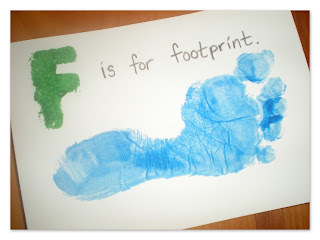 We had a lot of fffun this week exploring the letter f! Here is what we did! "Fear not, for I have redeemed you. I have summoned you by name, you are mine. . . says Isaiah 43 verse 1." 1. 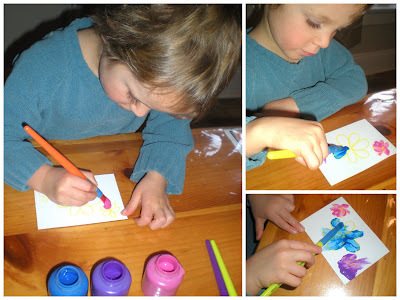 Tear pieces of tissue paper and glue them on to a piece of paper. Add lots of strips of foil. 2. Fold the paper in half and crease the fold well. 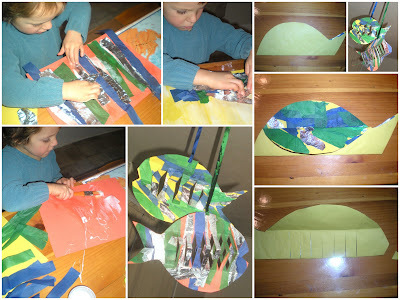 Draw a fat fish shape and cut it out. 3. Bend over the top edges until it touches the fold at the bottom and press hard to crease it. 4. Turn the fish over and bend the other top over in the same way. 5. Unfold the top pieces, snip a mouth and make cuts up to the fold. 6. Half open the fish and pull every other strip out and pinch in the middle so that it stands up. 7. Use bright thread to hang up your fish. 2. Use pipe cleaner for the feet and decorate with feathers and googly eyes. Malachi named his feathered friend, Tonto! Can you guess why? "What is this a picture of?" (Looking at a picture of a fish). What is the first sound you hear in fish? /f/! 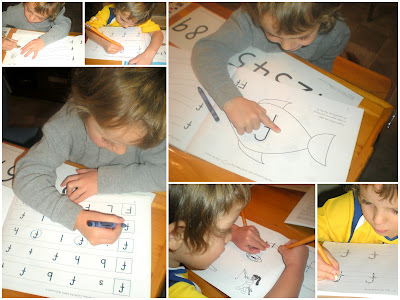 Can you name the letter that stands for the sound /f/ that you hear at the the beginning of fish?" This is the pattern we followed all week for words beginning in f. What fun! Some of the vocabulary words we covered in the book are fish, fan, football, fork, foot, fence, finger and fishing. Malachi was excited to have his very own school that he can do "right by myself," as he puts it! 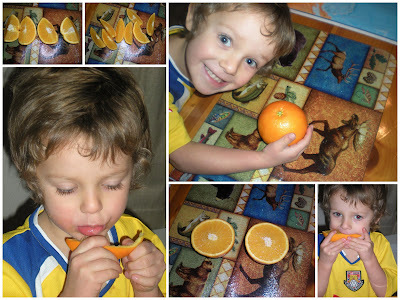 He had fun completing the pages on the letter f.
Fruity Fractions - We cut an orange into halves, then quarters, then eighths. I asked Malachi how many halves it takes to make a whole, how many quarters, etc. and helped him put the pieces back to see if he was correct! We found as many items beginning with f that we could find, like foam egg carton, a feather, a funnel, a fork, a football, a piece of foil, floss, a "ferocious" lion, a fast car, a "funny" bug. . .etc! 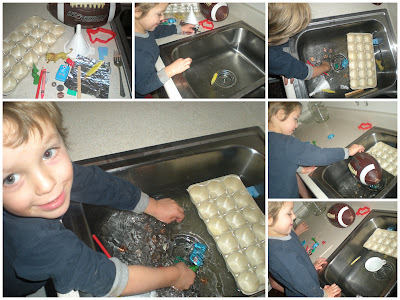 I had Malachi make a prediction as to whether he thought the item would float or sink. Then he tested it. Many items he got correct. Some surprised him! This was a lot of fun! 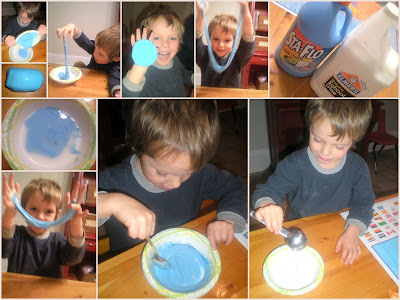 To see how we did this fun concoction, check out my post on Stretchy, Rubbery, Bouncy Fun! Malachi caught on quick to what we were doing this week. On his own, he gathered up all the stuffed animals he could find and told me these were his furry friends! I love it! Here are some of the books we used for our fun filled f exploration! 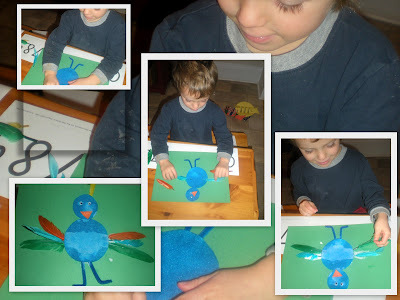 For more preschool fun, check out The Preschool Corner! Boy, that is a lot of 'F'! Fun, fantastic, and fruity! Great job! Love all the pics! :) The fractions and the putty look like a lot of fun!